These lyrics are part of “Words” by the Bee Gees. “Words” was one of the first songs my dad taught me to play on the guitar probably about 8 years ago. It is also the last song he ever played, which was just two days before he was admitted to the hospital. These few lyrics mean the world to me. “Talk in everlasting words and dedicate them all to me” The reason I blog, the reason I get up every morning, the reason I try my hardest in school is for my dad. I dedicate my world to him. “You think that I don’t even mean a single word I say. It’s only words, and words are all I have to take your heart away.” Words is what I use. It’s what I use to help people cope with cancer and it’s all I have. Words are all I have to show the world that I would do anything to help those coping with cancer and words are all I have to tell the universe how much I really do love and miss my dad. I wanted to give a special birthday shout out to my beautiful and strong mother today! 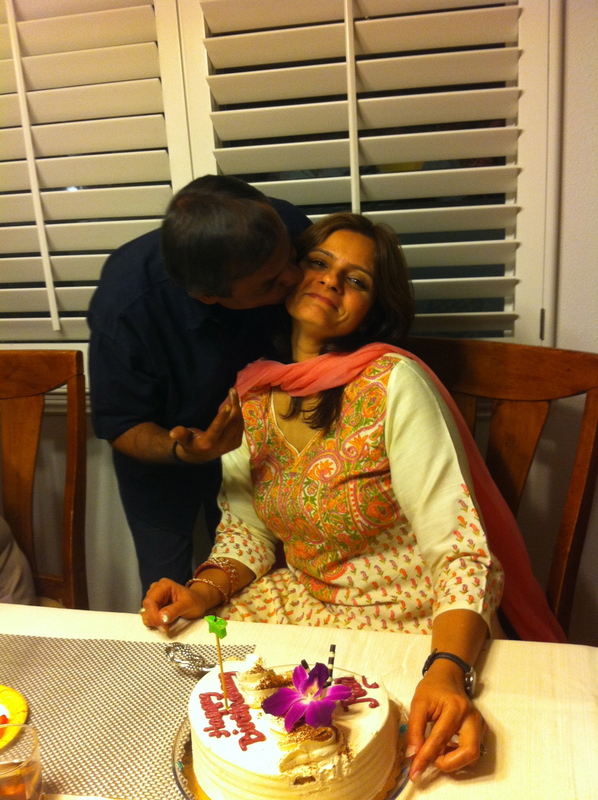 So, happy birthday to the woman who bent over back to take care of my dad during the lowest points of his life, who did everything in the world to keep this family intact and strong, and who has motivated me to follow my dreams and ambitions even without my dad in my life anymore. You are the strongest woman I know and I hope to be at least half the person you are today when I’m a mother. I love you so much! Thank you for being the best mommy AND daddy! This past weekend, I went to the Farmer’s Market and I saw a booth for children fighting cancer. They had a great fundraiser going on. 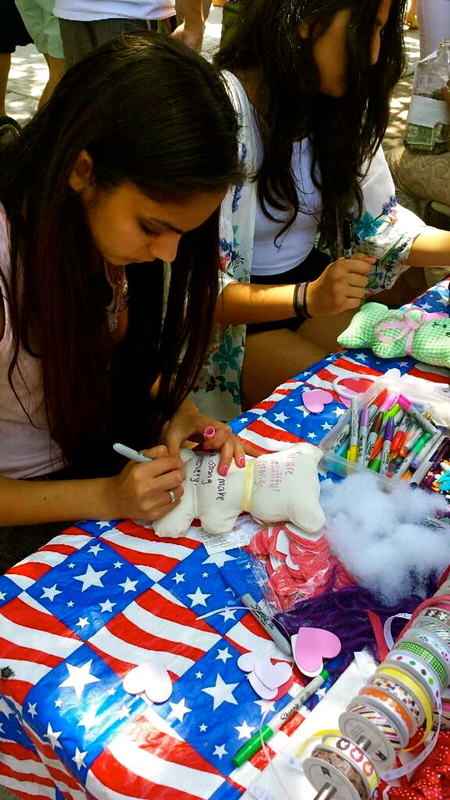 The organization was selling little bears to stitch and decorate. The donator had the choice of giving it to a child with cancer or they could pay a few extra dollars and keep the bear. The second option was more for the little kids who participated, but still all of the profits went to the cancerous children so it was a win-win situation! Every time I see a cancer fundraiser, I cannot bear (pun intended) to not participate in it. I remember when my dad was in the hospital, some volunteers gifted him a small pillow they stitched. He actually used it every single day when he was in the hospital and when he was on Hospice. Eventually, we had an inside joke about it and now every time I think about it, I smile. 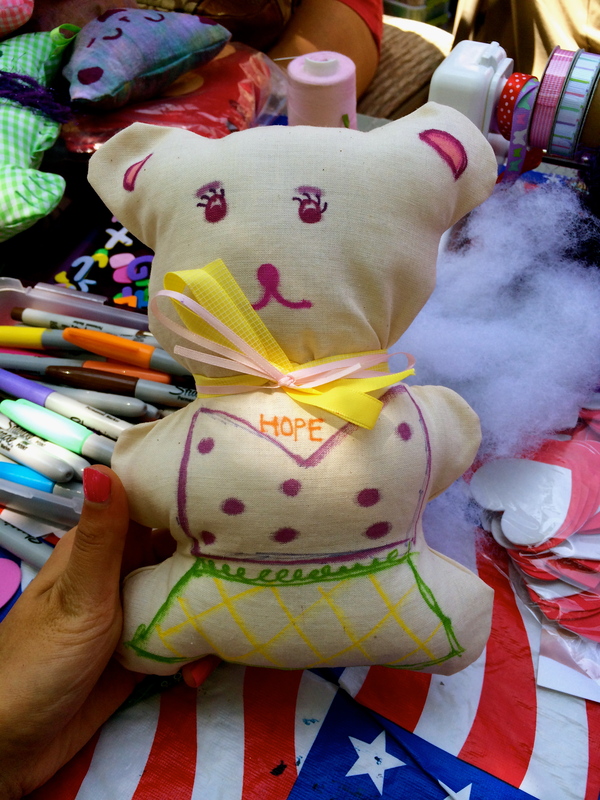 Cancer patients honestly adore and appreciate the little crafts volunteers do. A small piece of fabric, some stuffing, a thread, a needle, and your time can go a very long way. I know that this bear will make a child’s heart very happy! Here are some pictures from the activity. 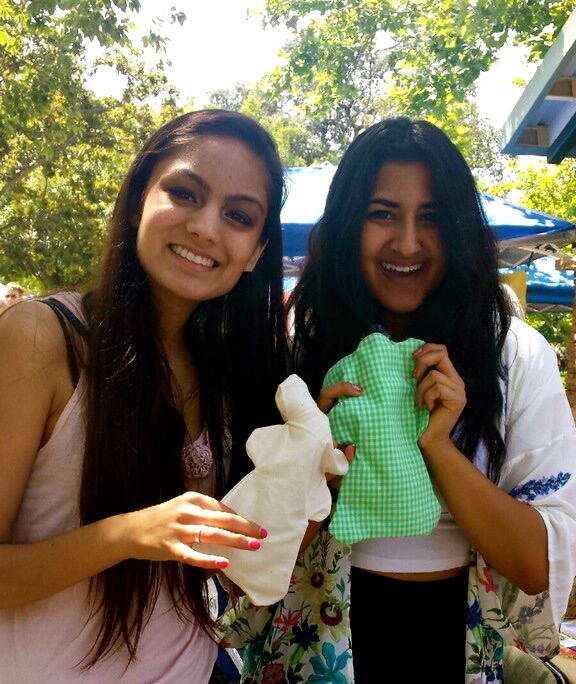 The pieces of fabric my friend and I used to sew the bear and decorate it. Writing a message for the cancer patient. Drawing the face on the bear. The front of the bear. The back of the bear. I never actually thought this day would come. I was in such denial. I walked through the hospital doors and found my dad’s room. The doctors told me what was going on. I watched everyone cry. I took my dad home from the hospital to Hospice. I carried his bags to the car. I helped him from the wheelchair to the car. I watched the nurses cry when he left. I saw the pain in my dad’s face. I saw my dad on Hospice. I saw the Hospice workers explain the “Do Not Resuscitate Form” to my mom. I watched my mom sign it. I watched the nurse take my dad’s pulse for the last time, look at me and shake her head. I was there through it all, but I still never thought the day I would lose my best friend would actually come. I watched it. I watched my dad die everyday. But one day, it actually happened. I think at first I was in complete shock. At 18 years old, I still didn’t understand what was going on in my life. I kept asking myself why was this happening to me. Why did I have to lose my dad- my best friend? 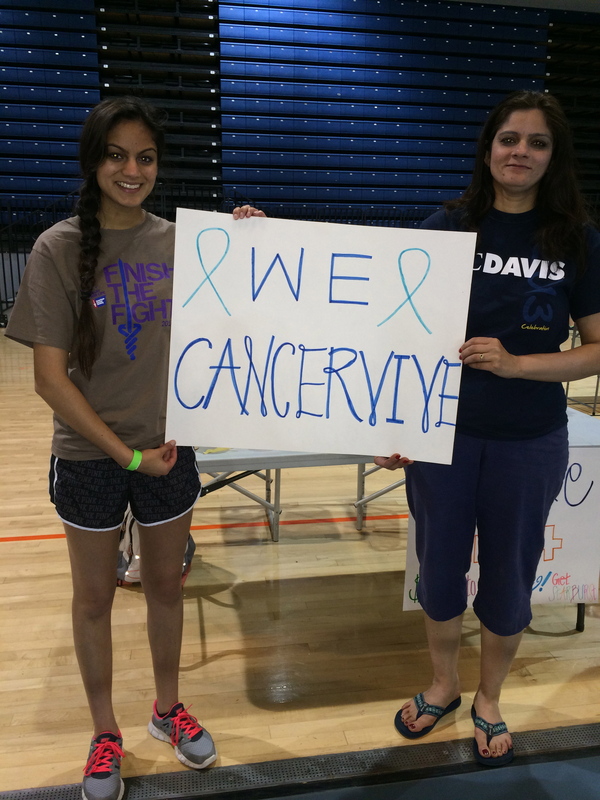 This past weekend, I was able to participate in Relay for Life at the university I am attending. 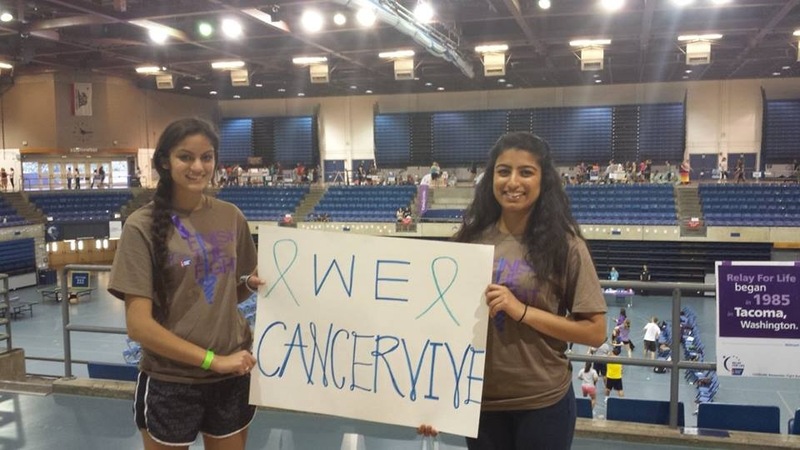 Relay for Life is a 24-hour cancer walk held by American Cancer Society. Their goal is to fight back against cancer, celebrate those who have survived, and remember those who have lost their life to the awful disease while fundraising thousands of dollars. Later on in the event, there is a ceremony called Luminaria. Luminaria is a time to remember and honor those who have passed away. The Luminaria ceremony was emotionally difficult for me. It was scary and weird to hear my dad’s name and see my dad’s picture during the ceremony. In the past years I have participated in Relay for Life, I never thought I would walk during the Luminaria lap in honor of my father. I am so grateful my friends were right there next to me. They held me as we walked the Luminaria lap. It was so reassuring to know that I have a support system who empathizes with me, rather than sympathizes for me. Although it was a moment of deep mourning for my dad, I felt beyond thankful for those surrounding me and felt my heart fill with joy. 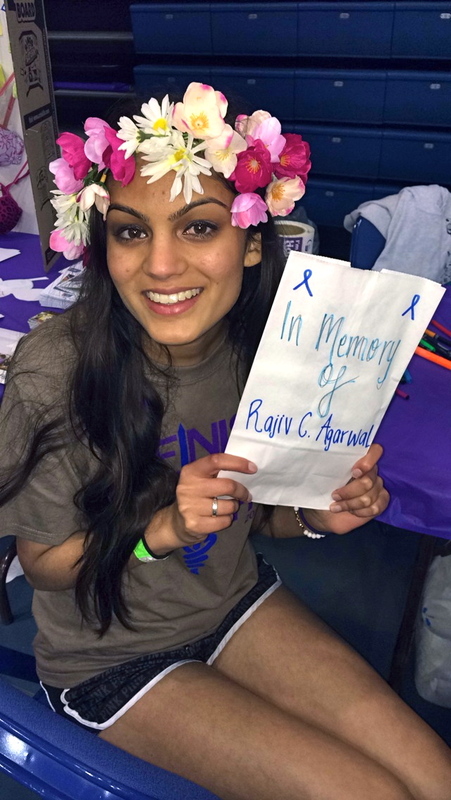 Relay for Life was such an amazing experience. I have mentioned this before, but just to reiterate, it is helpful to give back to the community. It’s a great way to cope with cancer. At events like this, you can share your story without being judged and have someone listen that knows what you have been through or are going through. I love volunteering through American Cancer Society (and the other organizations I am apart of). And to be completely honest, volunteering and helping people cope with cancer are some of the few things that get me through each day while grieving over my father. It brings a smile to my face knowing that I am changing someone’s life in one way or another. April is Testicular Cancer Awareness Month! Testicular Cancer occurs in a man’s testicles. Please share this post with friends and family because with more people educated on cancer, less people will be diagnosed! Stay positive! April 16, 2013. My world started falling apart. I walked into the Good Samaritan Hospital and felt my heart drop. I knew this was not just the regular doctor visit. I found my way around the hospital and came up to my dad’s room. When I walked in he yelled, ‘Lulu Lulu!’ (This nickname will be explained in another blog post.) I was so happy to see him and he was so happy to see me. He was not doing well. He was very sick at this point. I knew something was wrong, but I wouldn’t admit it to myself. I cried in her shoulders for a few minutes, wiped my tears, got myself ice cream and got my dad ice cream. I walked down the hall with a fake smile on my face and came into my dad’s hospital room excited to eat ice cream with him. Only later did I realize that this was going to be the last time I ate ice cream with him. Throughout the day, he never said anything about him dying. I heard my mom crying on the phone outside his room to multiple people but she never really told me anything either because she was too busy dealing with phone calls and doctors, and of course my father’s needs. One of our really good family friend took me to the library down the hall a few hours later. She sat me down and explained to me that this was real. She said that this is it. She said explained to me that the chemotherapy stopped working and there is nothing else the doctors could do. I asked her a few questions and she answered. We just sat there in silence for sometime. I cried for sometime. I walked back to the hospital room to find more of my family friends. Some of our other very good family friends sat in the car while I drove to her house to spend the night with her daughters, whom I consider my sisters. I could barely drive because I was crying so hard. My head was pounding. I couldn’t think straight. I felt like throwing up. I stopped by at my house to feed my dog and pick up my stuff to spend the night at their house. My mom was living in the hospital with my dad and my sister was in the East Coast at this point. I came to my family friend’s house and walked into her room. We looked at each other and neither of us said a single world. I just started howling. I cried and I cried. I tried to throw up. Nothing came out because I didn’t eat anything the whole day. I drank some water and took some Advil. I fell asleep crying in my family friends arms. My dad was truly an amazing person. He was the life of every party, the captain of every team, the sunshine on a cloudy day, the tickle monster when in a grumpy mood. He made every guest and every relative feel so at home in his house. 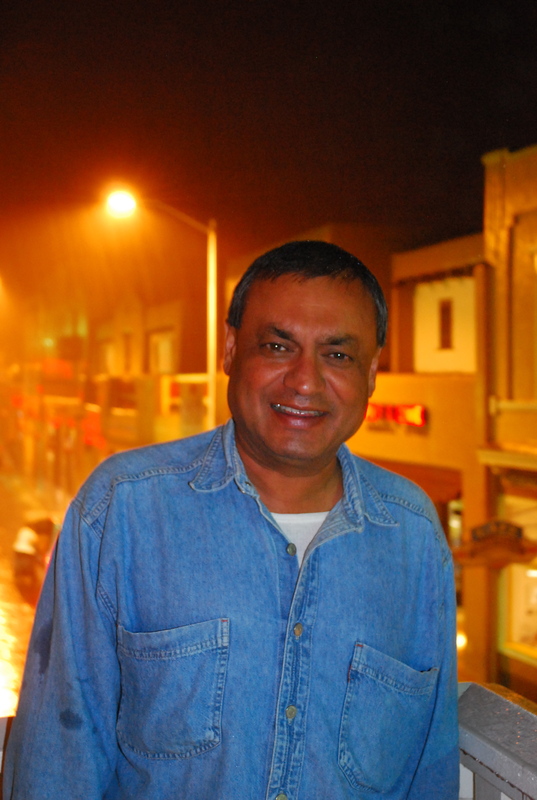 He was the most generous and selfless man I had ever met in my life. My dad never forgot anyone’s birthday or anniversary. He was a best friend to many people and always helping others. He never showed his pain while going through chemotherapy. He was always smiling, whether it was during the economic recession or the day he was admitted to the hospital he was making some sort of joke. He made his last joke within the last hour of his life. His last words were thank you. So, thank you dad. Thank you for teaching me everything important in life. Whenever I would fail a test, you would actually laugh at me and say, “Let’s make a bet on you failing the next one.” Thank you for showing the importance of hope and positivity. Thank you for hiding your pain during the last month of your life to make it easier for your friends and family. Thank you for the being such a caring husband, brother, and son. Thank you for being the greatest dad any little girl could ever ask for. Thank you for being my hero. Thank you for leaving your legacy, and I promise I will live by it now. And, Happy Birthday. Happy birthday to the man who inspired this blog! Something that always calms me down and gives me time to gather my thoughts is anything artsy or craftsy! I have learned that this really helps when coping with your parent’s cancer. Recently, I started scrapbooking memories of my dad so I could hold on to them and cherish them forever. 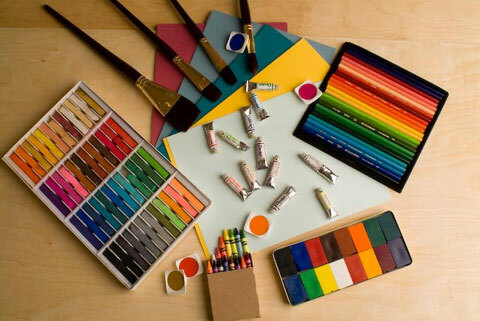 DIY (Do It Yourself) projects are also fun because you get to be as creative as you want and you save money! 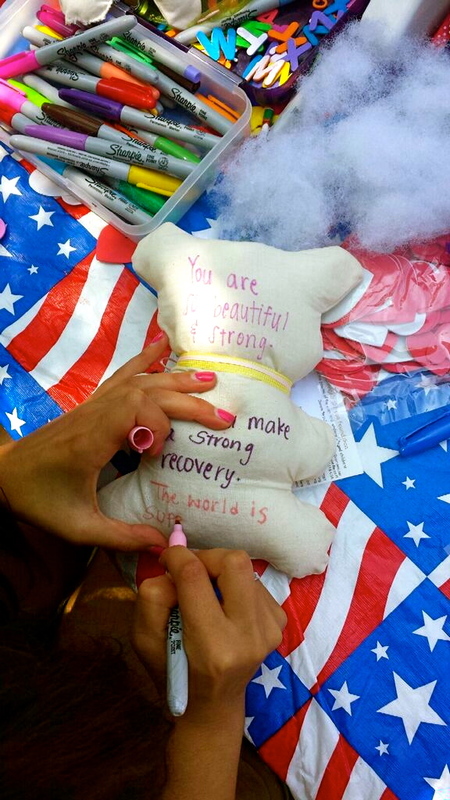 There are a ton of DIY projects that could help cancer patients too! 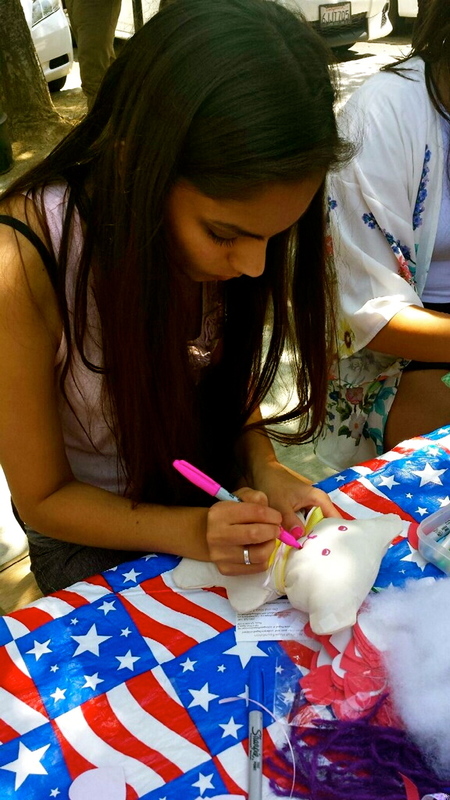 For example, if your parent or loved on is going into surgery or is in the hospital, you can sew them a little pillow and blanket with a pattern that they would appreciate. They would also feel more ‘home-y’ and less ‘hospital-y’. Another great example is knitting beanies or something similar for patients who have lost their hair. If you have a sick parent, grandparent, etc. I think it would be therapeutic to do an art project with them. This way, both parities can let out emotions while creating memories during a tough time. Studies show that art therapy helps a sick patient by reducing anxiety levels, improving social skills and communication, and controlling the pain in a better way. Stay positive and keep spreading those smiles! 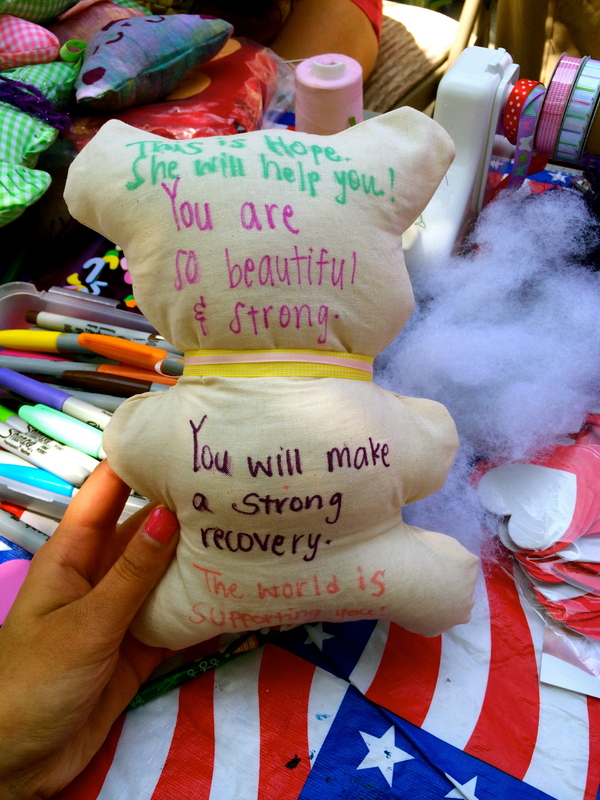 For more DIY ideas for cancer patients, email copingwithcancerforkids@gmail.com! Heart disease is the number one killer in women. And unfortunately, heart attacks, heart failure, and other types of heart diseases are too common in both genders. Because it is so prevalent in many lives, it is so important to be educated on an unhealthy heart and to know what to do when an unfavorable situation comes upon you. 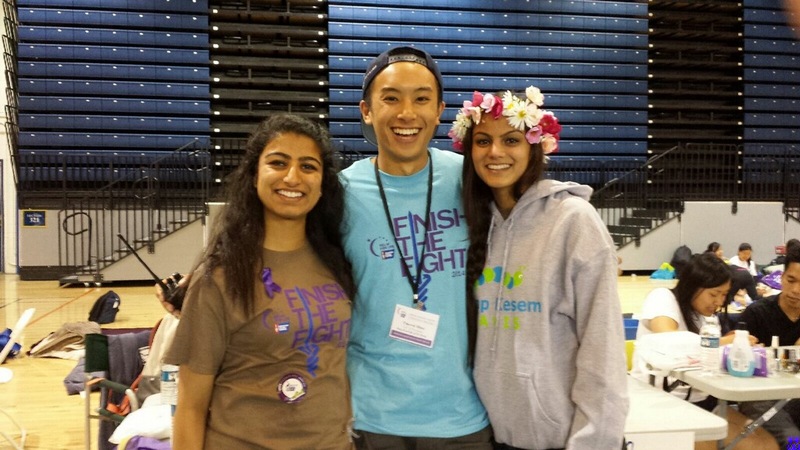 Recently, I was blessed to be able to help raise awareness about this deadly disease. Students wore red and gathered around at a specific time to get educated on a healthy heart, and to educate others! I personally think knowing CPR is extremely important. I strongly recommend everyone to get certified in this as soon as possible. Unfortunately, no one can predict the future. You might be sitting in a restaurant and the person behind you chokes or you might be sitting in your house when a loved one experiences a heart attack. By getting certified in CPR, you can save a life. You can make a difference. You can be a hero to a family. There are many medications and surgeries doctors can do to help a bad heart. For example, doctors can put in a stent for weak hearts to help with the flow in arteries. Doctors can also perform bypass surgery when arteries are blocked. Keep a healthy heart, help others keep a healthy heart, and spread those beautiful smiles! The weight loss. The fatigue. The nausea. The metallic taste. The hair loss. The appetite changes. The pain threshold changes. The mouth and throat sores. The numbness in the hands and feet. The swelling. And many, many more. How do you watch your parent go through these side effects (sometimes more, sometimes less)? How do you sit there at work and know the pain that your parent is going through or gone through? How do you study in school knowing how much your parent is suffering or suffered? 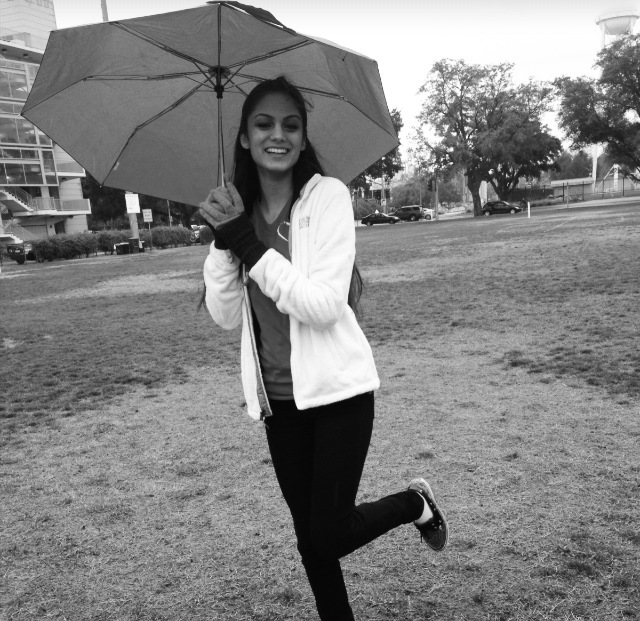 How do you smile while cancer is ripping your life apart? I remember the first time I took my father to chemotherapy. At the time, I was just 16 years old. It was his third round of chemotherapy. A few hours into the session, something went wrong with the patient sitting across my dad and all the doctors ran in and closed the curtain. I saw that he was shaking uncontrollably and he practically turned purple. I could not handle it. I kept thinking to myself that the same thing would happen to my dad. I couldn’t breathe. I started shaking. I was beyond terrified. I felt like I was going to faint. At the time, my dad fell asleep. (I’m happy he was napping at the time because I would hate for him to see me like that.) I somehow found the energy to walk to the elevator and go down to the parking lot for some fresh air. I called my mom crying my eyes out. I kept saying, “I can’t do this. I can’t do this.” I let all my feelings and tears out. It took me a few minutes, but I pulled myself together and walked up the stairs to my dad. He just woke up from his nap. I acted like nothing was wrong and started a pleasant chess game with him. He won, as usual. Each time your parent (or loved one) goes to chemotherapy a piece of your heart dies. It feels like the cancer punched you so incredibly hard and literally reached into you and cut out a piece of your heart. I wish there was something I could do to ease you from this pain. Unfortunately, it’s just part of the cancer. If you cannot handle it, then I suggest leaving the room. Do not bring down your parent. They need your support. Give them the motivation to fight this disease. Fight this disease with your parent and never quit. Do everything in your power to help your parent become a survivor. Take them to chemotherapy. Put up with their mood swings. Give them the food they need to help with the nauseous feeling. Take care of your parents. Always take care of yourself too! Cancer is always going to be a distraction in school and work but try your best and that’s all anyone can ask for. As awful as all of this feels at the moment, it’s better than having your parent gone. There were many times where I mentally had a difficult time taking care of my dad, but now that’s all I want to do. One of the hardest things while coping with this awful sickness is looking back at pictures from the time your parent did not have cancer and immediately noticing the changes that the disease has brought on. It’s hard seeing that transition of your own parent from a healthy and active person to a cancer-stricken patient. When I look at recent pictures of my dad, I see the cancer in him. I see the wrinkles that came in the last two years; I see the defined cheek bones and sunken-in eyes due to the weight loss; I see the peeling hands and feet from the chemotherapy; I see the cancer. To protect myself from more pain, I try not to look at those. It’s especially hard because if you lost your parent (or loved one) to cancer, your most recent and vivid memories are petrifying. You remember the weakness, the throwing up, the change of temper, and all the other chemotherapy affects. As difficult as it is, it is so important to remember your loved one in a healthy form. It’s going to be a struggle rewinding to a couple years ago, but it will be a healthier way of grieving (or dealing with this new change in your life). Always remember that cancer doesn’t define a person. Stay positive and spread smiles! Having a sick parent is tough. It’s also frustrating, sad, chaotic at times, depressing, scary and much more. It’s hard to cope with all of those feelings, while living a life. It’s also a challenge to keep those feelings separate from your school and social life. I highly suggest talking to someone. It’s too unhealthy to keep all those negative feelings bottled up. Therapy is a great option to let it all out. Saying your feelings outloud to a specialist will help you feel better and more secure. 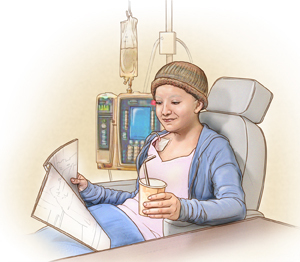 I’m also sure that your parent’s oncologist knows of programs you can join or someone to talk to. You could also talk to your school counselor or any teacher. For that matter, you could talk to any adult that is willing to just listen! Talk to your friends if you don’t feel comfortable talking to an adult. Just talk to someone! You will feel better afterwards. If your parent is in the hospital or under Hospice Care, they will have social workers for you! If they haven’t already reached out to you, give them a call and see what they can offer to you. Some insurances also cover a few free therapy sessions, so check that out as well. Therapy can be time-consuming and challenging at times, but the outcome is worth it. Remember to do your research about the therapists near you if you plan on seeking that help! Stay positive!